Ha, another friend has done exactly the same with her cookery books… result looks very similar, I admire it each and every time I visit… looks FAB! If only I could be even 10% as organised as this! That makes me smile. Maybe I’ll have a go too, when I move home. How long did that take you? I recently put all of mine into author order, and it took ages as I looked through EVERY one as I did it! I really like the effect of seeing those in colour order. 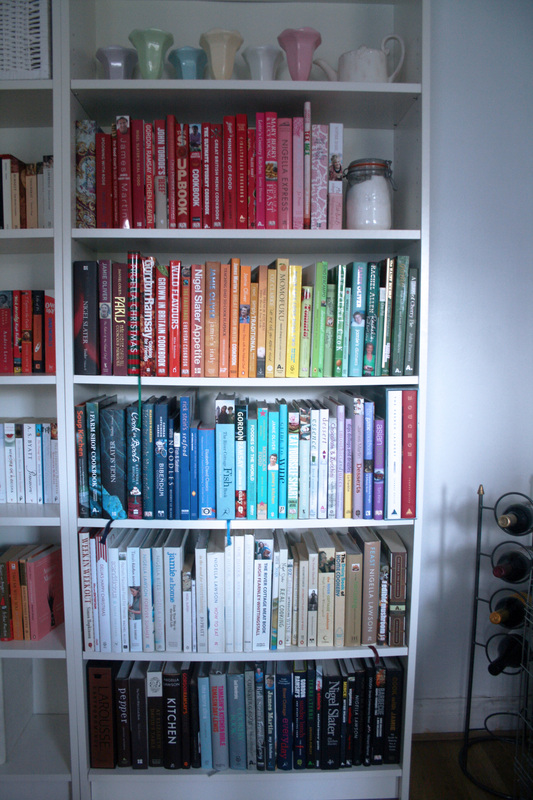 A rainbow on your bookshelf! I love this, it’s so me. Wish I had time to colour code by books, it looks great! That’s a Peter Pan Happy Place- right there. Adore it. Yes, everybody has it’s own way of getting things in order and finding things. The colour-system has a positive plus – it looks great! Love this because you have so many books & you are so organised… If only I was halfway as sorted!